The Great Sphinx of Giza (Arabic: أبو الهول‎ Abū al-Haul, English: The Terrifying One; literally: Father of Dread), commonly referred to as the Sphinx, is a limestone statue of a reclining or couchant sphinx (a mythical creature with a lion's body and a human head) that stands on the Giza Plateau on the west bank of the Nile in Giza, Egypt. 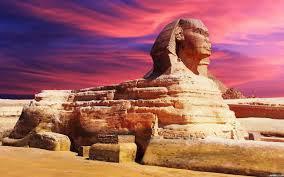 The face of the Sphinx is believed to represent the face of the Pharaoh Khafra. It is the largest monolith statue in the world, standing 73.5 metres ft) long, 19.3 metres (63 ft) wide, and 20.22 m (66.34 ft) high. It is the oldest known monumental sculpture and is commonly believed to have been built by ancient Egyptians of the Old Kingdom during the reign of the Pharaoh Khafra (c. 2558–2532 BC). The Sphinx is a monolith carved down into the bedrock of the plateau that also served as the quarry for the pyramids and other monuments in the area. Because of its geological history, the nummulitic limestone of the area consists of layers of widely differing quality offering unequal resistance to erosion, mostly due to the wind and windblown sand, which explains the uneven degradation of the body of the Sphinx. The floor of the Sphinx depression and lowest part of the body including the legs is solid, hard rock. Above this, the body of the lion up to its neck is a heterogeneous zone with friable layers that have suffered considerable disintegration. The layer in which the head was sculpted is also much harder. The Great Sphinx is one of the world's largest and oldest statues but basic facts about it are still subject to debate, such as when it was built, by whom, and for what purpose. 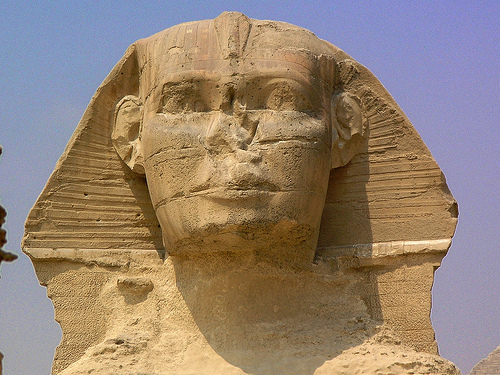 These questions have resulted in the popular idea of the "Riddle of the Sphinx" alluding to the original Greek legend of the Riddle of the Sphinx. 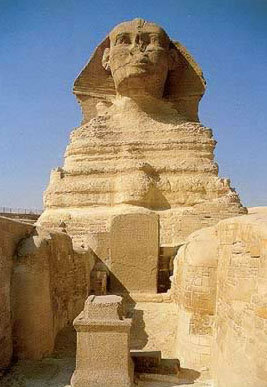 Pliny the Elder mentioned the Great Sphinx in his book, Natural History, commenting that the Egyptians looked upon the statue as a "divinity" that has been passed over in silence and "that King Harmais was buried in it." 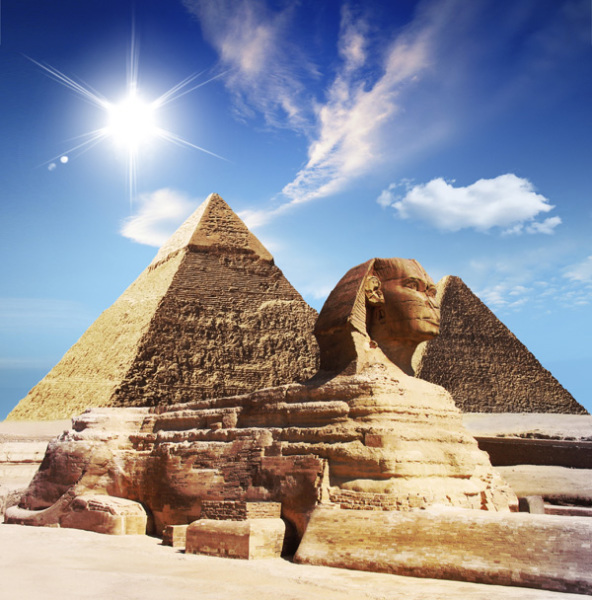 Some of the early Egyptologists and excavators of the Giza pyramid complex believed the Great Sphinx and other structures in the Sphinx enclosure predated the traditional date of construction (the reign of Khafre or Khephren, 2520–2492 BC). In 1857, Auguste Mariette, founder of the Egyptian Museum in Cairo, unearthed the much later Inventory Stela (estimated Dynasty XXVI, c. 678–525 BC), which tells how Khufu came upon the Sphinx, already buried in the sand. Although certain tracts on the Stela are considered good evidence, this passage is widely dismissed as Late Period historical revisionism.[why? Gaston Maspero, the French Egyptologist and second director of the Egyptian Museum in Cairo, conducted a survey of the Sphinx in 1886 and concluded: The Sphinx stela shows, in line thirteen, the cartouche of Khephren. [n 1] I believe that to indicate an excavation carried out by that prince, following which, the almost certain proof that the Sphinx was already buried in sand by the time of Khafre[n 1] and his predecessors [i.e. Dynasty IV, c. 2575–2467 BC]. This marvelous object [the Great Sphinx] was in existence in the days of Khafre, or Khephren,[n 1] and it is probable that it is a very great deal older than his reign and that it dates from the end of the Archaic period [c. 2686 BC].